According to a report published in THE TIMES OF INDIA, Over 14% of Indian, living in urban cities are suffering from chronic constipation. Constipation is common for many, but the chronic constipation can be really painful and they find it hard to empty the bowel. Experts blame it to the unhealthy eating habits including frequent consumption of non vegetarian foods and less consumption of water. There are foods and remedies that helps relieve constipation. Today in this post, we are going to discuss about best foods and remedies to relieve constipation. Constipation is a condition when you are unable to completely release your bowels. Those who suffer from chronic constipation, find it really difficult to release bowels every day. Some of the symptoms include difficulty in bowel movement, stomach pain, bloating, gassiness and loss of appetite. Usually the stools will appear a bit hard, dry or lumpy. Nowadays, people tend to eat the junk foods more, which are devoid of water, fiber and other vital minerals and nutrients. One should eat such types of foods carefully or try and avoid these foods completely. 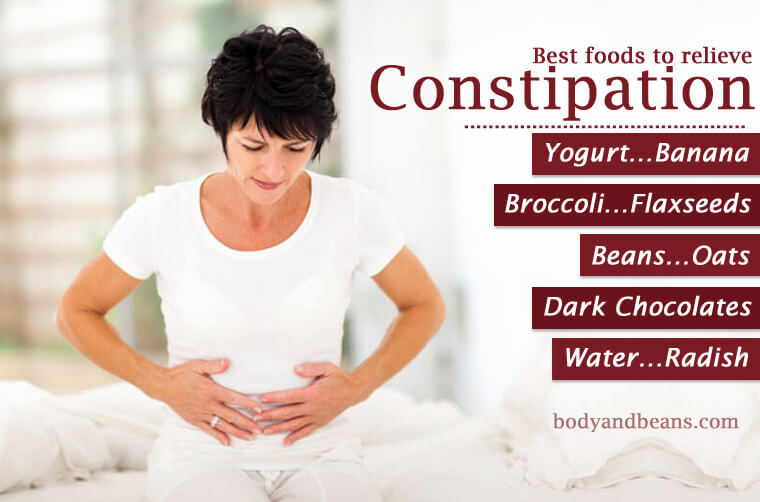 There are some foods which can relieve constipation pretty quickly. The food which is rich in water and dietary fiber can be very beneficial in constipation and offer instant relief. Foods like vegetables, nuts, and fruits have high percentages of dietary fiber in them which enhances the liver functions and the formation of roughages. Include the foods in your daily diet and get relief from the excruciating pain of constipation. Here are some of the best foods worth including your daily diet because these are the best known foods to relieve constipation. Yoghurt is the most beneficial probiotic which helps in better digestion. More bile will be produced by the liver which will break down the food particles easily. The yoghurt will also improve the intestinal tracts and thus give you relief in constipation. Beans are high in both soluble and insoluble fibers. One cup of bean may have up to 10 grams of fiber, which is probably more than other food products. Include beans in your diet to get relieve from constipation. Radishes are rich in indigestible carbohydrates which help in improving digestion, water retention and also curing constipation. Radishes often go unnoticed because many are unaware of its benefits. Radish is roughage that can detoxify the liver and promote healthy bowel movements. Corn has low calories and high fiber content. Corn is a whole grain with insoluble fibers and thus it offer relieve from constipation. Grab a bowl of pop corn or use corn in any other recipes, it’s really good for those who are suffering from. Dark chocolates are healthy, not just tasty. There are innumerable health benefits of dark chocolates, and one of them is to cure constipation. They contain magnesium which relaxes the muscles of the intestinal tract, digestive tract, ensuring smooth bowel movements. When you buy dark chocolates, make sure that there is 70-74% cocoa present in it. The highest proportions of fiber are present in oat grains in oat meals. Oats are not only good for digestion, but also heart health. If you have high cholesterol, then oats are for you. Grab a bowl of oatmeal for your daily breakfast. One cup of broccoli will have 5.1 grams of insoluble fibers. Due to the rich fiber content, it acts as a strong agent to cure constipation. You can add these gorgeous green vegetables in your soups and salads, and get rid of the pain of bowel movements. These tiny seeds can work wonders when they are consumed daily in salads and smoothies. Ground flaxseeds are good for your overall health and for constipation too. One teaspoon of ground flaxseeds will have 3 grams of insoluble fibers. They also have omega 3 fatty acids which are beneficial for your heart. Ripe bananas, which are soft and yellow, can ease constipation. Have one banana daily in the mornings for instant relief from constipation. Avoid eating green banana though, because green banana has high content of starch, which restrict bowel movement. Always eat ripe banana, because it helps in moving the stool in the intestinal tract. Water is clearly the healthiest drink of the world; there are thousands of benefits of water. Water helps in relieving the constipation, it helps in proper digestion, and it also helps in breaking down the foods fast. Drink 6-8 liters of water daily to cure constipation. 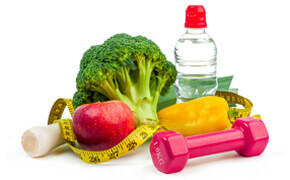 Apart from eating fiber rich foods and drinking plenty of water every day, you should keep yourself active. Getting up early in the morning, going on a walk, practicing yoga etc are anyways good for overall health and well being. And if you feel like you are having constipation related issues, you may like to try some of the following remedies to relieve constipation. A bit of physical exercises and daily morning walk can cure constipation permanently. A brisk 15 minutes walk will help you to loosen up, you will be able to improve your digestion, your intestines and colon will function better than ever. Among Chinese and Amish folk healers the sesame seeds were known to cure constipation. The seeds contain oil which can moisturize the intestinal tracts for better bowel movements. You can add the sesame seeds in salads and also mix it with tea, and drink it. The menthol present in mint has an antispasmodic effect that helps in relaxing the muscles of the digestive tract. Ginger is a beneficial part of herbal medicine. Ginger creates body heat which can boost up the digestion process. The hot water present in tea will also boost digestion and cure constipation. The lemon is a natural detoxifying agent which can flush out the toxins in the body, and thus improve digestion. The lemon will also keep your body hydrated, so mix some drops of lemon juice in water and drink it every day in the morning. You can also add lemon juice in tea and also in honey and warm water. In Ayurveda, castor oil is known for curing constipation within few hours. Consume 1-2 teaspoons of castor oil daily, and you will feel the need to take a trip to bathroom within 8 hours. Castor oil is a laxative and this will cure constipation within few hours. If your situation is critical and there is blood in your bowel movements, then you must visit the doctor as soon as possible.